The Rugby Visitor Centre & Theatre is the daily starting point for viewing the national award winning Rugby history film, The Power of a Dream, and for guided walking tours of some of the key historic buildings and exhibits at Historic Rugby. You’ll also view the 32-foot 1880s Rugby mural before starting your one-block walking tour with an informative guide. 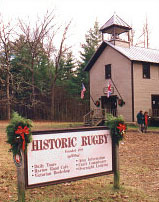 You’ll visit the 1882 Thomas Hughes Free Public Library, the founder’s home 1884 Kingstone Lisle, 1887 Christ Church Episcopal and the 1907 Schoolhouse with exhibits featuring Rugby images through the years. This library is virtually unchanged since it opened in 1882. Its diverse, 7000-volume collection was donated primarily by American publishers in honor of Hughes and represents the entire spectrum of reading tastes of the late Victorian period. . Founder Thomas Hughes’ house is based on an ‘English Rural Style’ cottage drawn by the famous American landscape and architectural designer Andrew Jackson Downing. It clearly reflects Hughes’ and Downing’s shared belief that buildings should harmonize with their natural surroundings. Furnished today with many original Rugby pieces, the cottage reveals much about early life in Rugby. The 1907 Schoolhouse contains pictorial exhibits that trace more than a century of Rugby’s history. 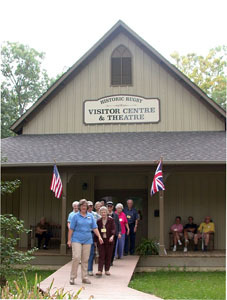 This building was built on the same foundation as the original 2 1/2 story public building constructed by the Board of Aid to serve as school, church, and later as the meeting place for the local order of Masons. The first building burned in 1906. As there were still dozens of children attending school at Rugby, the Morgan County Board of Education had this building constructed with the typical one large room for teaching downstairs and a lunchroom upstairs. It served as Rugby’s all-grade school until 1951.